NATURENORTH.COM is proud to announce: Jellyfish in Manitoba! You never know what you'll find in the wilds of Manitoba. 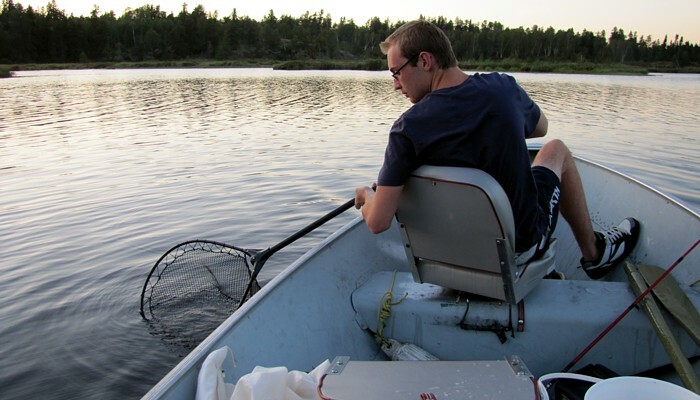 Turns out at least one lake in Whiteshell Provincial Park is home to freshwater jellyfish! At NatureNorth we believe in citizen science: people out there keeping their eyes open and helping us all to understand the amazing natural heritage of this province. 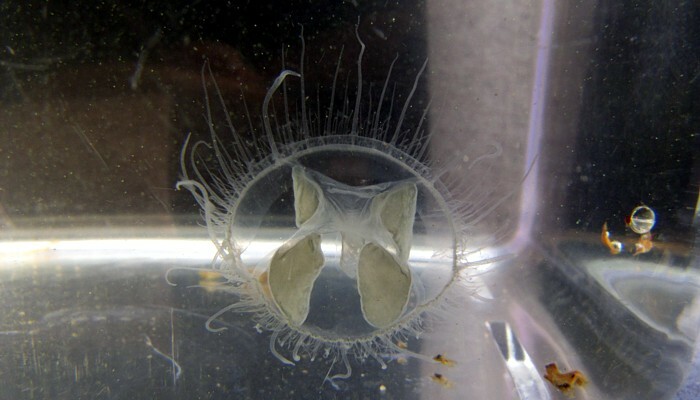 Freshwater jellyfish found in Manitoba for the 1st time? The things you see lounging around on a tube in a secluded bay! 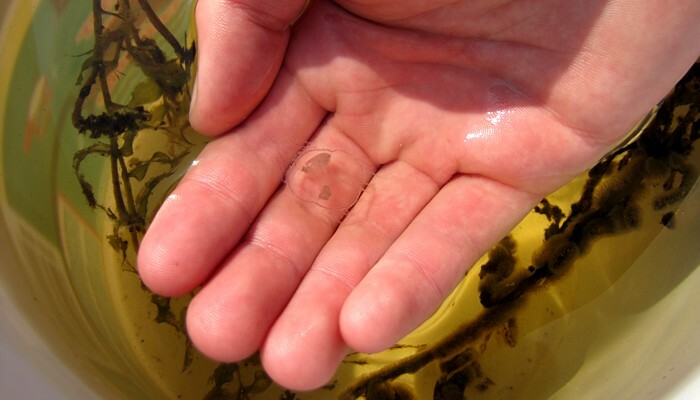 On August 22, 2010 Daniel Collicutt, son of NatureNorth biologist, Doug Collicutt, spotted several odd "blobs" floating around in the water of a small bay at the northwest corner of Star Lake in Manitoba's Whiteshell Provincial Park. He scooped a couple of them into the lid of our boat safety kit (finally, a use for that orange plastic bailer!) and we all had a look. Not wanting to believe my eyes at first, it soon became obvious that there were no other choices, they were jellyfish! 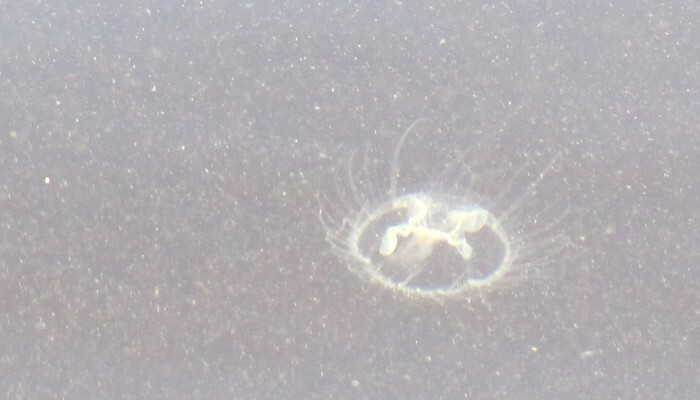 Small, only the size of a penny or larger ones, a nickel, they were definitely jellyfish. I was flabbergasted. Jellyfish Update 2018: "I spotted another jellyfish in the dive site at West Hawk Lake. Spotted it Sept 23 around 2:00pm at about 12-16 feet deep." Thanks, Greg! Just had a report on Sept. 16 of Jellyfish in West Hawk Lake in the protected dive area near the main beach. All near the surface in the top metre. Thanks, Dan. Jellyfish Update 2016: No sign of jellyfish in Star Lake this year. I've been watching over the last week and none have been spotted to Aug. 28. Jellyfish Update 2015: Saw one (1) jellyfish by a dock near the south end of Star Lake on Aug. 8. Quite early for a first sighting Aug. 18 - Lots of jellyfish in the north end bay of Star Lake where they were first sighted. Aug. 20 - Counted more than a dozen off our dock in the south end of the lake. Looks like a good jellyfish year! Jellyfish Update 2014: None were seen or reported in 2014. Jellyfish Update 2013: No sign of jellies yet this year. A quick survey on August 25 turned up no jellyfish. 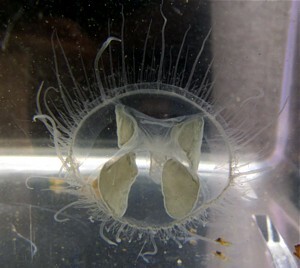 Jellyfish Update 2012: A report in the September 6, Winnipeg Free Press says the jellies are back in Star Lake! They were spotted by cottager Larry Santa on the Monday of the Labour Day long weekend, presumably out in the same bay in the NW corner of the lake (that's where Larry usually hangs out in his pontoon boat). That's fairly late in the year for a first sighting of jellies, wonder how long they'll hang around? Let us know if you see them in your lake: Email NatureNorth. We'll post updates as we get them! 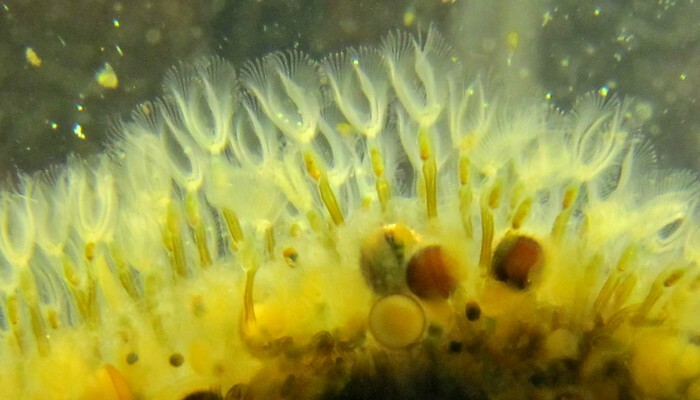 Jellyfish Update 2011: No sign of the jellies in Star Lake this summer! And we've had no other reports of them in other Manitoba lakes in 2011. 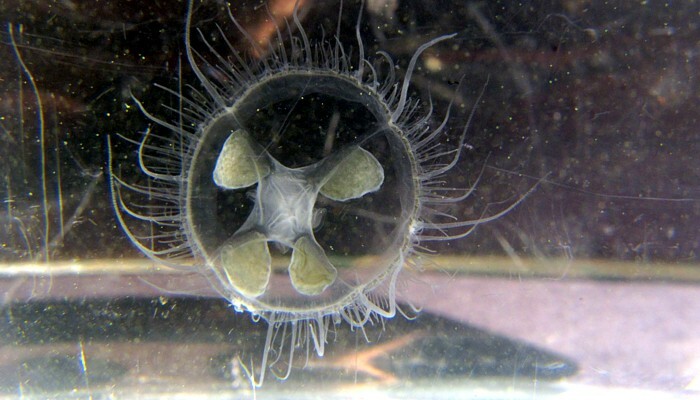 Caddy Lake has jellies! We've had a report of large numbers of jellyfish being spotted in Caddy Lake, Whiteshell Provincial Park, on the weekend of September 10-11, 2011. Caddy Lake is downstream from Star Lake, via West Hawk Lake. Wonder if they're in any other Whiteshell Lakes? Well, it looks like the jellyfish are gone for this season. Water temperature in Star Lake has dropped dramatically and we didn't see any jellies this last weekend. Thanks, to a southern Ontario NatureNorth viewer who reported jellies in Baptiste Lake, near Bancroft, ON. Sept. 8, 2010 - Correction! 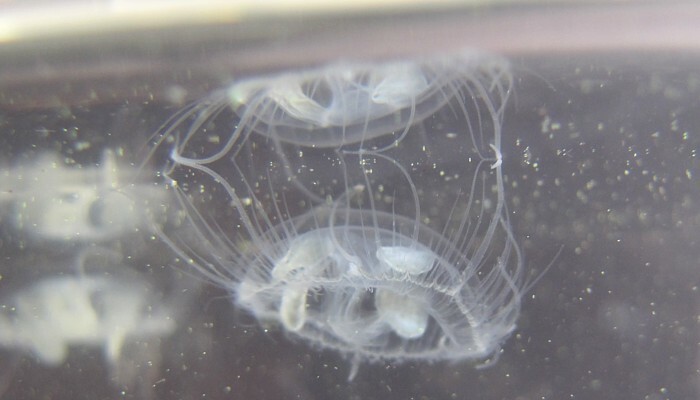 We provided some specimens of the jellyfish to the Manitoba Museum yesterday and had some time to surf around the internet on a high speed connection (dial-up only at the lake). Discovered that what we thought might be the polyp form of the jellies, isn't! 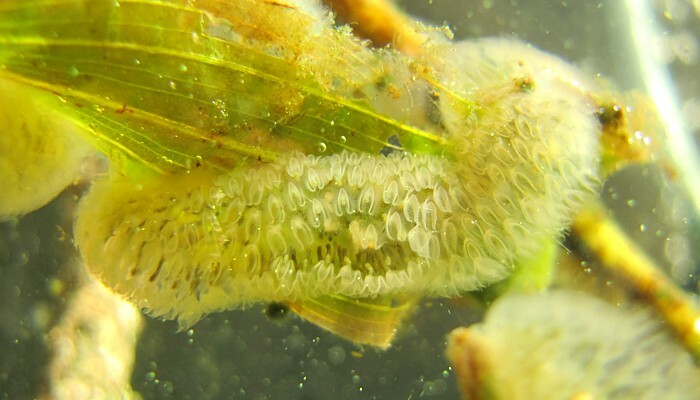 It turns out to be another strange invertebrate, a bryozoan, Cristatella mucedo! We left the pictures of them up in the article, but changed the captions to state what we HOPE is their correct identification. We're waiting on word from the Museum. Hmm, the emergence continues. Thought it was over, but yesterday and today there were lots (100's) of jellies floating around the same bay at Star Lake. Wonder how long they'll hang around? Amazing what a little publicity will do. We've had a report of jellyfish in Caddy Lake, too. Caddy Lake is downstream from Star L. Star flows into West Hawk L which flows into Caddy L. I suspect this is the first of a few reports we’ll get of jellyfish in other lakes. Hmm, the plot thickens. Turns out the Star Lake emergence is a rediscovery of this species in Manitoba. In today's Free Press, Lane Graham, a Senior Scholar at U of M, reports sightings of jellyfish from as early as 1972. Guess there really is nothing new under the sun. Kinda makes a commentary on the state of knowledge of Manitoba's biodiversity, though. It would be nice if somebody would put all the eggs in one basket, and tell everyone else where the basket is. Rats, looks like we got scooped! According to the Aug. 30 Free Press article some of our neighbours reported the jellies Aug. 21! Oh well, can't be first in everything. But we've still got the best images and video right here on NatureNorth.com. The main "flowering" of jellyfish in the NW corner of Star Lake may be over for now. There were only few decrepit looking ones around on the 29th. But they're started showing up at the south end of the lake by the main beach now! Doubt they would have swum the 2 km from the other side of the lake, so perhaps another colony is releasing medusae (jellyfish) now. We'll keep you posted. 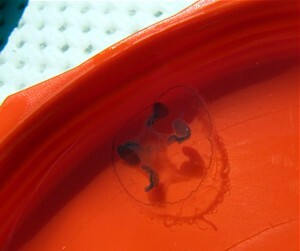 Here's some more images: Click for Jellyfish photos. 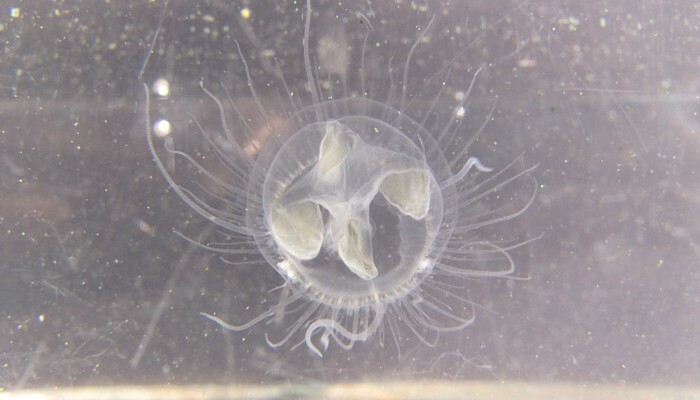 The freshwater jellyfish, we learned, is actually an invasive alien species that has been spreading around the globe after being accidentally exported from China. The first records of it in North America are from the 1880's. It's been found in Ontario, BC, Quebec, Minnesota (all around us! ), it just may not have been documented here in Manitoba. We're still waiting on confirmation that our sightings are Manitoba's first. If it turns out the be the case, Daniel will have some interesting bragging rites! Interestingly, since the 22nd the numbers of jellyfish in this bay of Star Lake has increased dramatically. On the evening of the 26th we were fishing and saw several dozen jellies pulsing around near the surface. On the morning of the 27th of August, we went out to take some video and pictures in the bay and found the site swimming with jellies! There were many hundreds of them! It looks like we had just happened upon the start of the emergence last Sunday. How many more will there be? We'll keep track. And we'll research the biology of these cool critters more and add in some more stuff to this article. But we just had to start spreading the word that "there's jellyfish out there!" And we've got the images and video to prove it! 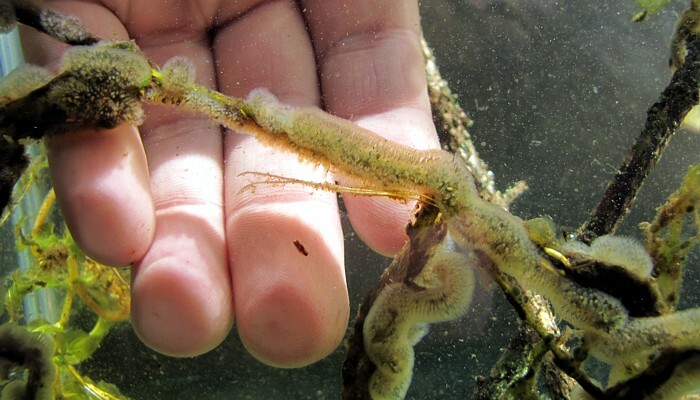 But please don't panic, there's no evidence that these little guys are harmful to people in any way (we had them in our hands to no effect), and they don't seem to be harmful to aquatic ecosystems either. Small mouthed bass aren't native to Manitoba, either, and they are considered a boon to our sport fisheries. Maybe "jellyfishing" will catch on, too? And now for some cool video! Check this out, click the "play" button below! And remember, you can watch this video in high definition! If you find jellyfish in your lake, pond or stream please let us know! We'll start keeping track of them in Manitoba and pass the info along to Manitoba Conservation and Dr. Peard. Drop us a line at: Email NatureNorth.